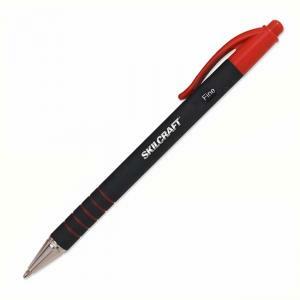 Ballpoint pens feature a rubberized barrel with gripper rings for easy grip comfort. The ink cartridge contains ink that won't fade or smear. Color of the cap and clip matches the ink color. Each ballpoint pen writes 2,460'. Refillable ballpoint pens contain 83 total percent recycled material with at least 80 percent post-consumer material.